“The Wind in the Willows” published in 1908 by Kenneth Grahame has often been referred to as a pastoral hymn to the rural beauty of England and the relatively un-spoiled countryside of the early 1900s. England’s grassy meadows, gentle rivers with margins of trees and summer flowers, quiet woodlands, and dusty lanes between high hedgerows linking hamlets and villages can still be enjoyed today between motorways and strip malls. The book’s characters are vital, stalwart, thoughtful beings, eccentric in their own gentle ways and perhaps in our view over a hundred years’ later a little on the narrow side. There is a familial theme linking the characters of Ratty, Moley and the Badger. The Rat introduces the insular and naïve Mole to the life of the river-bankers, harbors him from danger and looks after his introduction into a new life. The Mole, the obedient, good child, throws aside his underground existence for an adventure into a larger world and tentatively goes forward toward a greater maturity. The Badger, grave, reserved, the unquestioned leader is the voice of authority among the friends and their community. All very relevant roles in the family of the early 1900s. 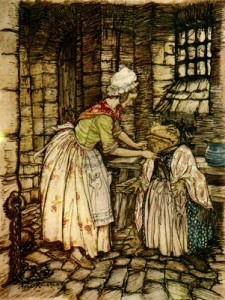 Grahame’s most compelling character of the piece is the Toad: wayward, easily led but at the same time ungovernable; an egocentric buffoon, softened by great humor who comes slowly through many misadventures to the understanding that tradition and therefore observance of society’s rules has its place. One of the reasons we love Toad and can’t wait for another chapter dedicated to his all consuming obsession with driving (or stealing) fast motor cars, is that he is endearing and brilliantly funny; has an abundant zest for life; his escapades full of derring-do. The exasperating but lovable adolescent in the family of Grahame’s characters. The ‘Wind in the Willows’ wasn’t just a a portrait of solid, middle class family life to share with one’s children at the end of a ramble in the country with butterfly nets. An unspoiled bucolic paradise where the motor car and the railway engine are the only villains in a world populated with good fellows, and where the stoats and weasels form a collective group of ‘baddies,’ who get their just deserts when they step out of line. But another world that Grahame created as a place to escape from his own very disappointing one. Wouldn’t you imagine that Mr. Grahame was one of those rather portly, bushy moustached Edwardians who enjoyed rambling through the countryside surrounding Cookham Dene, his home for a few briefly happy years. Can’t you see him coming home to tea on a winter’s afternoon to a kindly wife and a pleasant family? Ratty, Moley and the Badger? 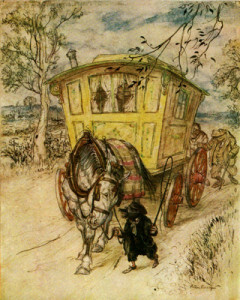 ‘The Wind in the Willows,’ is as packed with images of the perfect English summer as we could possible wish for: picnics by the river on lazy July afternoons, drowsing with a fishing rod among the willow-herb and purple loosestrife on the river’s edge, or wading in its shallows catching tiddlers with a net. They bring back memories of collecting frog spawn from the village pond to keep in jam jars on the nursery window sill so we can watch the tadpoles hatch. I always imagined that Grahame was the kind of man who looked forward to taking his youngest on his knee; and as the fire settled, told tales of imprudent Moles who ventured forth uninvited into the Wild Wood in the teeth of a winter storm. Well part of this was true, the stories at bedtime certainly were, even if they were to one rather sad, lop-sided little boy. But sadly Grahame’s life was rather a disappointing one, and most of all it would seem to himself. His mother died when he was very young. His father escaped the problems of being a single parent by drinking himself slowly to death, and Kenneth and his siblings were sent off to live with their grandmother. There were many to-ings and fro-ings during his childhood. When Dad Grahame decided he would take another wack at being a father he’d send for his four children, but it didn’t last long, and the kids were inevitably sent back to Cookham Dene and Grandma when things fell apart. Grahame had wanted to go to Oxford, but this had not been possible, and he had been shuffled off to the Bank of England where he spent miserable years trying to fit into a life of banking and commerce as a gentleman clerk, and apparently not succeeding. It took him years to rise up through the ranks to become the bank’s secretary. Just before he retired a “lunatic Socialist” as he was referred to in the newspapers came into the bank and took three pot shots at Grahame, narrowly missing him. Which certainly doesn’t fit with our idea of orderly Edwardian England. Far more like the random shootings reported on network news in America. It was not long after this hair raising experience, in an otherwise uneventful and decidedly dull career that Grahame resigned from both bank and Wide World and retired to write. His marriage, a desperately unhappy one with a wife who sounds as if she was distinctly batty in the most vacuous and debilitating way made home life as unbearable as the bank. His son who seems to have suffered from the same disenfranchised youth as his father, was a wayward, misunderstood boy expelled from several schools. He did however go to Oxford, his father made sure of that, but tragically committed suicide when he was twenty. So the Wind in the Willows was Grahame’s escape, it was where he went to enjoy a better world, to find people who lived simple, kindly, thoughtful lives and who did not make a fuss about the little things: like eating with your mouth full or imperfect grammar, but took great care over the important things of life: loyalty, friendship and honor. It was where he went to find those happy hours that had been his at Cookham Dene when he was living there as a child. This beautiful book received almost universally stinking reviews. ‘Grown-up readers will find it monstrous and elusive,’ wrote the Times critic. ‘Children will hope, in vain, for more fun.’ Arthur Ransome judged it to be an out-and-out failure – ‘like a speech to Hottentots made in Chinese’. 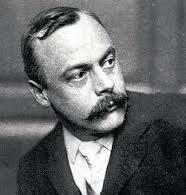 The only reviewer who saw its merits was the novelist Arnold Bennett, who pronounced it ‘entirely successful’. Salvation, though, came from an unlikely quarter: the then US President, Theodore Roosevelt. Grahame sent Roosevelt a copy of The Wind in the Willows and Roosevelt loved it and wrote to the American publishers Scribners, effectively telling them they had to publish it. Scribners obliged and from then on public appreciation – and sales – kept on rising. So do yourself a favor, if you haven’t already read this delightful book, and get yourself a copy – the one with the Arthur Rackham illustrations!